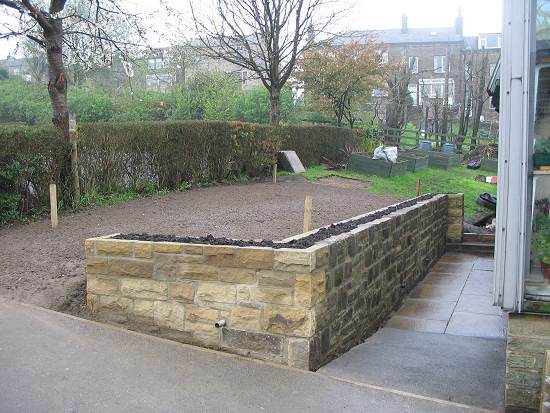 Haworth Primary School Gardening Club was formed in 2002 and is run by Steve Thorpe with volunteer help from the children and parents of Haworth Primary School. It takes place on two tea times a week and at present teaches about 40 children from the ages of seven to eleven. It was first set up to make use of the previously unused school greenhouse, which was renovated, by the school P.T.A. and because of all the damage that was being done around the village. We thought if we taught the children how to grow and look after plants at a young age they might respect things in their community when they become teenagers and maybe even become keen gardeners. Flower beds are planted up at the entrance to the school and hanging baskets and planters are put around the school building to help make it a brighter and happier place to work in and visit. The children have carried out permanent planting in the way of a rose red, shrubberies and an herbaceous perennial bed. Tomatoes, peppers and cucumbers are grown in the greenhouse along with all the vegetables and bedding plants. Once we got the school looking colourful we thought it would be good for the children to carry out work in the local community. They have now found out what a good feeling can be gained from carrying out this work. They now plant up the police contact point, fire station, railway station and mangers at the cenotaph along with many other community based projects. The children also do a charity raising event every year. During the past four years they have raised nearly £10,000 for charity. Since being formed in 2002 the gardening club has won dozens of awards and were given a Gold award by Yorkshire in Bloom. The Gardening club has won many other awards: 6 trophies at the Haworth, Oxenhope, Lees and Crossroads Annual show, a trophy at the Keighley Horticultural show, the Sir Richard Graham Youth Enterprise Award, from the prestigious Yorkshire in Bloom competition, 2nd in the Henry Doubleday Research Association Organic Gardens for Schools Projects Harvest Festival Challenge 2004. 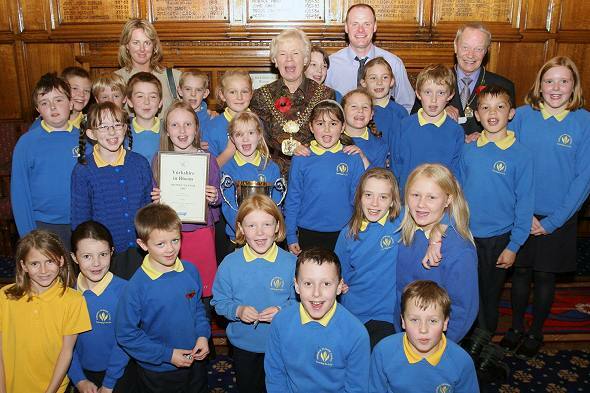 In 2005 were awarded the Schools Environment award by the Rotary Club International at Manchester. C. D. Construction, Park Spring Quarry, Raiseprint, A.P.S. Signs, Mitchell's Glass, Whiteheads M.O.T's, Aireview Equestrian Centre, Acorn Garden Supplies, J & C Clayton, Pickard Hardware, Keybury Security systems, Lindisfarne Care Home, Reid's Bookshop Ltd, Pennine Models, Coltec Parker Ltd, Haworth Brow Post Office, MCC Auto Centres, Hartley's Books, G. Moore & Company, Njoy - Nicola Offord Hairdressing, Bronte Taxis, Haworth Old Hall, Rhodes' Hardware, The Merry Mellon & Max's flowers, Timothy Taylor, C & L Herd, Regal Interiors, S. Pedley Funeral Services, Farmet Engineering, Keighley Tree Services, GNER, Northern Rail. I started the last newsletter with a phew! so this one definitely needs to start with a double phew! What a year 2006 was for the gardening club. Nine awards, which included gaining Gold Standard with Yorkshire in Bloom and a trip to London for tea at the House of Lords. That will take some keeping up to. We would like to thank everyone for all their support in all the different fundraising activities we have had. I know we always seem to be asking for something but hopefully we have make a big difference to making our school a better place to work in and visit and improving the lives of people less fortunate than ourselves. I know that I am proud to be associated with Haworth Primary School so I hope you all feel the same. I am definitely so proud of all the members of the Gardening Club who represented the school in such a kind, generous and unselfish way. The sponsored plant was an absolutely brilliant success and such a fun event to be involved with. I set myself a target of trying to plant 1500 plants in the hour, but I still can’t believe that I managed to plant 2021. I would like to thank everyone for helping on the day and in helping to make the event so successful by getting lots of sponsors. Poor Mrs. Parkinson, who sponsored me so much a plant, it cost her a fortune. All in all we raised a fantastic £1809.55, which included money from Barclays employee pound for pound sponsorship. This should hopefully go a long, long way towards buying the school a stage to carry out their fantastic concerts and performances. The pumpkin soup event turned out to be an absolutely brilliant success from start to finish. We owe a big thank you to Tim Rushworth from the Weavers restaurant for coming into the school and actually making the soup with the children. This was another giant step forward in our healthy eating program and the children just loved the experience. The seven stone pumpkin was absolutely perfect when cut open and made most of the two big pans of soup which I am sure you will agree was absolutely delicious. A big thank you to everyone who bought a cup of soup for 50p. We managed to raise £103.72. Together with the nursery who raised a brilliant £88.70 Haworth Primary School managed to raise £192.42 for Children in Need. Well done! The Gardening Club owes a big thank you to Mrs. Armstrong, who won £50 worth of gardening vouchers by entering a competition in the Community Pride magazine. After being impressed by the work carried out by our gardening club in the local community, she very kindly donated her prize to the Gardening Club. Community Pride were so impressed with her generosity that they decided to give £50 to both parties. A big thank you to all concerned. Actions like this make all our work feel so worthwhile. What an honour and surprise it was to be named National School Food Hero. Not in my wildest dreams could I have ever imagined winning such an award. The pleasing thing for me is that our work has been recognised by people outside the Bradford Metropolitan area. I received the award at the BBC Good Food Show at the NEC in Birmingham from Jamie Oliver along with a cheque for £1000.00 for the gardening club to spend on a project. I see the award as a big team effort. If it had not been for the children, Mrs. Parkinson, staff at the school, the kitchen staff and all the help from many parents, my work would not have been recognised. On Saturday 2nd December all the members of the Gardening Club were invited onto the Santa Special by the Keighley and Worth Valley Railway. This was in the way of a big thank you for all the work that the children do planting up the tubs at Haworth station twice a year. Everyone got a present from Santa and had a brilliant afternoon. On Tuesday 18th December members of the Gardening Club visited Lindisfarne Care Home for a new and what turned out to be a very successful new venture. Instead of the residents sitting watching the children planting bowls of hyacinth bulbs, my idea was to actually get them doing the planting with the children. I have always believed this would work really well and I was not disappointed. Everyone had a great evening and Father Christmas even called in to give all the residents a Christmas present. We are now looking forward to doing lots of new projects with Lindisfarne when their new day centre opens shortly. I would like to thank everyone for all the letters of congratulations we have received during the past few months. We have received letters from Alan Titchmarsh, Her Majesty the Queen, Prince Charles, Prime Minister Tony Blair, the Parish Council, ECS, Councillor Glenn Miller, and lots of parents and residents of Haworth. What a lovely feeling it is to receive these letters, it really makes all our work feel so worth while. On Monday 9th December Mrs. Parkinson, my son Joseph, myself and six members of the Gardening Club visited London for tea at the House of Lords with Baroness Andrews. She had invited us while being special guest at the Yorkshire in Bloom awards ceremony after being so impressed with the gardening clubs’ work and achievements. We had the very difficult task of trying to pick six members of the gardening club to go on the trip. In the end we decided the only fair way was to put all 40 members’ names into a bag and draw the six lucky names out in front of everyone in the school’s assembly. We owe a big thank you to GNER and Northern Rail for covering most of the travelling costs and making the trip possible. The Parish Council very kindly donated £120 towards any additional costs. Prime minister Tony Blair had found out about our trip and although he was out of the country he arranged for us to be allowed onto Downing Street to have our photographs taken outside number 10. This was followed by a tour of the Houses of Parliament and a visit to Westminster Abbey. We then went to the House of Lords where Baroness Andrews had arranged for us all to be allowed to sit in the afternoons Question time. We then had tea with Baroness Andrews before going back to the underground via Buckingham Palace. We all had such a brilliant day and owe a big thank you to Mrs. Parkinson for looking after us in the big City. The non-uniform day on Friday 20th October raised a brilliant £125.06 for ‘One Tree’ seeds for Africa. Hopefully this money will make a real difference to people who really need our help. As the charity does not have any running costs the money we sent would buy 70 new trees. Our efforts will help to protect their environment and encourage food security across Africa. All the local businesses whose adverts totally paid for all the printing costs and to our good friend Steve Bell at Raiseprint for making it possible. Please try and use some of the businesses who are supporting our school and tell them where you got their telephone number. To all the shops, parents and friends who have very kindly helped to sell the calendars and to all of you who have bought it and supported our fundraising. If anyone has any ideas of any charities they would like us to consider for some of the money please let us know. It is still not too late to buy a calendar. They still have over twelve months left on them as you get 13 months for the price of 12 for all those important dates in January 2008 that you usually have no place to write. We are not asking for the full £2.99 but it would be brilliant to try and get near to that £3000.00 mark. What an achievement that would be! We are looking for anyone who has a single axle dray or an old cart for sale for us to use as a feature for the school. We are thinking of putting it between the school bungalow and the main gates in a tipping position to look like it has just lost its load. All the area would then be planted with lavender to give off a fantastic fragrance. We would put a sign on the side saying ‘Welcome to Haworth Primary School’. This would be very prominent for anyone visiting the school. When I heard the tragic news about Lewis’ death I just felt numb. I can’t even imagine what Afron and Jodie are going through. All we can do is make sure we make a garden that is a fitting tribute to Lewis and will always be remembered as his garden. We were thinking of a garden with lots of uses, with raised sensory beds for the children to grow herbs to feel, smell and find out about their uses. A raised bed to grow lots of different vegetables that they can taste. A special seat with Buddleias planted at the side to attract all the beautiful butterflies in the summer. Bird tables so that all the nursery children can watch all the different birds feeding throughout the year. Nesting boxes on the greenhouse wall facing the nursery and bat boxes under the troughing. Wooden mushroom seats around the raised beds and willow arches especially for the nursery garden. We are also hoping to have a play farm with a few of Lewis’ favourite animals. If anyone has any ideas for the garden please let Mrs. Parkinson, Miss Roe, Mr. Plant, Ian Chapman or myself know. We want everyone to have input and make it really special. So far we have collected £217 but we will need lots more to make this garden. Mrs Parkinson has applied for a grant for another £500 but I think we will need in the region of about £2,000. If you have any ideas for fundraising please let me know. Donations can be sent to the school office. David Austin Roses have very kindly donated Alan Titchmarsh – The Rose bush to commemorate our school’s involvement in Alan’s charity ‘Gardens for Schools’ 2006. Rosa Alan Titchmarsh has a wonderful multi-petalled flower form and a warm old rose fragrance. It will form a beautiful shrub rose with slightly arching stems, reaching 4ft high x 3ft wide over several seasons. We are thinking of planting it outside our polytunnel that Alan and Alison very kindly opened for us. 19th December 2006 On Tuesday 19th December members of the gardening club visited Lindisfarne Care Home for a new and what turned out to be a very successful venture. 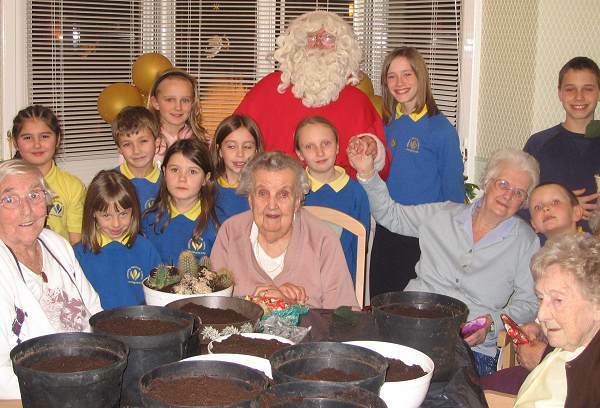 The idea was to take compost, bowls and hyacinth bulbs into the residents home. We did not want them to just sit watching the children plant the bulbs. We wanted to stimulate them by actually working with the children planting up the bowls of bulbs. Things could not have gone better and everyone had a very enjoyable evening. We even had a visit from Santa who brought all the residents a present for Christmas. We are now looking forward to working closely with Lindisfarne at their new day centre which will be opening shortly. Photo: Steve Thorpe. 11th December 2006 On Monday 11th December members of the gardening club visited London for tea at the House of Lords with Baroness Andrews. She had invited them whilst being special guest at the Yorkshire in Bloom presentation ceremony after being impressed with their work and achievements. 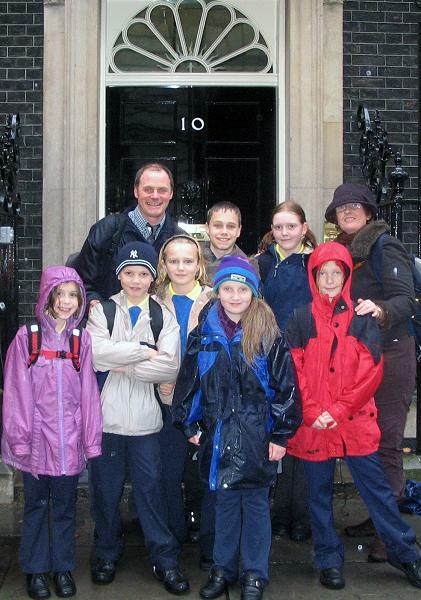 Prime minister Tony Blair had arranged for the children to be allowed on to Downing Street in the morning, which was followed by a tour of the Houses of Parliament. The children were allowed into the House of Lords for Question time during the afternoon, which was followed by tea with Baroness Andrews. The trip was made possible due to the generosity of GNER and Northern Rail who very kindly gave £120.00 to cover any additional costs. Photo: Jackie Thorpe. 2nd December 2006 On Saturday 2nd December all the members of the gardening club were invited on to the Santa Special by the Keighley and Worth Valley Railway. It was a thank you for planting up their tubs at Haworth Station throughout the year. 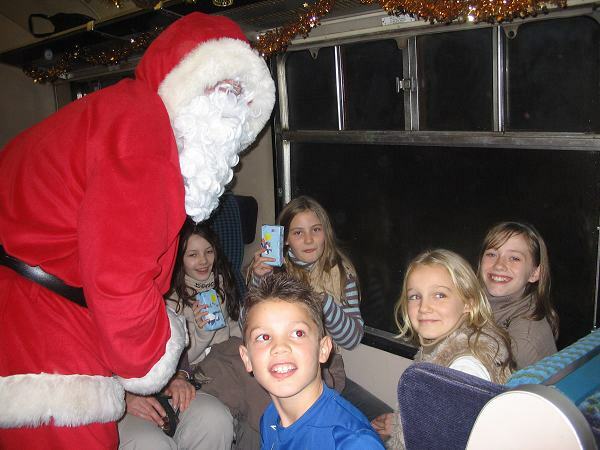 Santa visited all the children on the train and gave them a Christmas present. Photo: Steve Thorpe. Haworth Primary School Gardening Club is featured on BBC1 Look North News programme at 6:30pm onwards on Thursday 23rd November. 21st October 2006 Steve Thorpe who runs Haworth Primary School's Gardening Club did a sponsored plant in Haworth Park to help towards raising money for a portable stage for Haworth Primary School. Steve managed to plant 2021 in one hour! 15th September 2006 The Gardening Club launched their 2007 Calendar at the school. It was officially launched by Ian Clayton; writer, broadcaster and TV personality. Very rarely do you come across a gem such as Haworth School, the children are a joy to be around and an example to the community. If only all schools could develop similar clubs, the county would have a much improved environment for all to enjoy, well done and long may you continue. 1. The floral entrance to the school, with it s myriad of containers and baskets. 2. An extremely high standard of horticultural knowledge was demonstrated by everyone, especially the children. 3. The inclusion of the sunflower competition in the entrance demonstrated everyone s involvement, adding a competitive element to the entry. 4. The most impressive way the children have gone out into the community to plant and tend their plants in a variety of locations is a terrific example to everyone. 1. Possible further development of floral enhancement of the car park may add to the overall impression. 2. Perhaps a few more permanent plants could be further added to the seasonal displays. 3. The development of a main floral feature may add interest to the entry. 4. It is hard to see how the gardening club could do more in this area. 1. The permanent planting around the lawned areas with a good mixture of sustainable species. 2. The standard of the vegetable garden was to be commended, especially the variety and choice, with the opportunity for conservation and re-cycling. 3. Although the site is sloping, best use of space had been achieved using appropriate materials to level and lift areas of planting. 4. 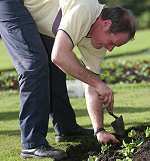 It was evident the club members were greatly involved in all aspects of horticulture within the school grounds. 1. It may be worth developing a themed bed on the grass above the car park area. 2. Continue to develop the planting of vegetables and maintain standards already achieved. Together with the exiting development of the new tree planting, inconjunction with Bradford Forest. 3. Further utilise hard landscape materials to create new planting spaces. 4. Continue to develop the permanently planted areas, encouraging children to try out new planting and develop their own ideas appropriate to the setting. 1. The area was totally litter free and tidy, obviously well respected by the children. 2. The new mushroom seats fitted in to the wildlife area perfectly. 3. Everyone was very aware of all the efforts of the children in improving the environment for the community to enjoy. 1. It is hard to see what more can be done to encourage cleanliness. 2. Consider a little more appropriate interpretation to enable the children to gain maximum benefit from their work. 3. Further develop links to the local media, use the school as an example of best practice for the area. 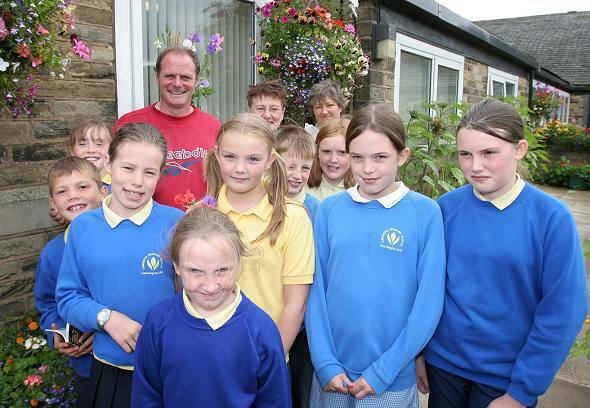 Haworth Primary School Gardening Club's 2007 Calendar is officially launched today. Yorkshire Television have been filming Haworth Primary School Gardening Club at the School, Surgery and Railway Station. The programme was on YTV Calendar news 6:00pm 17th August 2006. The 2007 Gardening Club Calendar will be on sale around Haworth and is priced £2:99, all money from the sales go to charity. 07th March 2006 Steve Thorpe who runs the Haworth Primary School Gardening club, braved the cold weather and sat in the stocks to raise money for the Sudan appeal. The Gardening club is raising money to set up and develop a growing area for a new school called the “Bread of Life Centre” near Port Sudan. Steve let children, parents and teachers throw wet sponges and custard pies at him which raised £163:03! Click on the picture for more information. 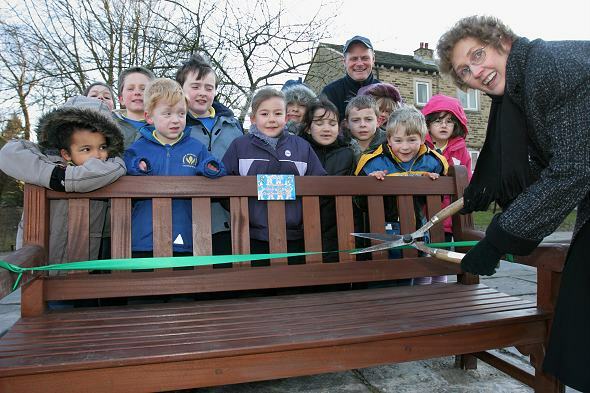 28th February 2006 Janet Parkinson, Head Teacher from Haworth Primary School officially opened the new seating area created By Steve Thorpe and the children from the Gardening Club. Steve would like to thank the Old Sun Hotel who donated £100, raised from quiz nights, CD Construction, Farmet Engineering and APS signs for helping with the project. The seating area is at West Lane, next to Heathcliffe flats. 30th October 2005 The children from the Gardening Club attended the Bradford City Council Civic Reception to celebrate the Yorkshire in Bloom achievements in the district. Photo: The Lord Mayor and Consort - Councillor Mrs Valerie Binney and Mr Donald Binney, Headteacher Pauline Anderson, Steve Thorpe and Gardening Club. 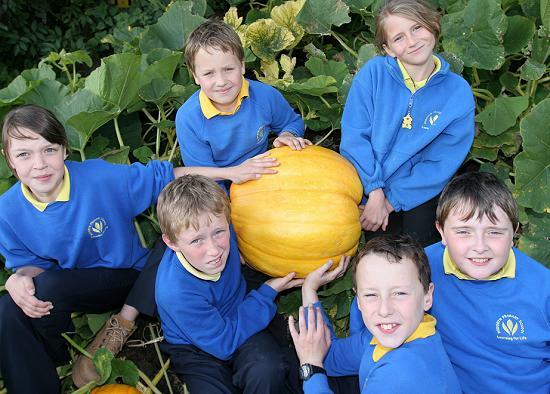 30th September 2005 The children from the Gardening Club harvested the pumpkins they had grown at the School, pictured with the biggest pumkin which weighed in at around 52lbs. 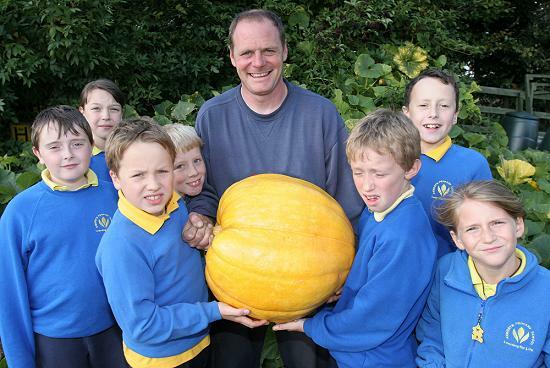 The largest pumkin grown in the UK was grown in Lancashire in 2004 weighing in at 915lbs, and the world record was from the US with a 1,400lb pumpkin. 14th Sept 2005 Haworth Primary School Gardening Club have won the Yorkshire Television's Sir Richard Graham Youth Enterprise Award at the Yorkshire in Bloom award ceremony! Click on the picture for more information. Thanks to all the volunteer helpers and the sponsors who have put so much work in to making the Gardening Club happen, and to the children who's enthusiasm and hard work make it worthwhile. 19th July 2005 Yorkshire in Bloom judges visited Haworth Primary School to judge the "schools" category. The results will be announced in September. 7th June 2005 Haworth Primary School Gardening Club visited the Yorkshire Air Ambulance at Leeds Bradford airport and presented a cheque for £1,055 to help with the air ambulances life saving work. A cheque for the same amount was also presented to Candlelighters, the childrens cancer charity. 11th May 2005 Alan Titchmarsh dropped in to say hello to Haworth Primary School Gardening Club. Alan had tried to visit last year to launch the gardening club calendar but due to filming commitments was unable to do so. Alan took time to answer questions about how he became a gardener and about some of his television programmes such as Garden Force and British Isles: A Natural History. “What are the best plants to grow around here” Alan’s advice was to check the PH of your soil but also to look at other peoples gardens to find out what grows best. Alan was shown outside and the new polytunnel was officially opened. He took time to show the children gardening tips and to sign books. C D Construction for showing such kindness and generosity in building the retainer wall outside the school greenhouse free of charge. Just when we had given up hope of being able to level the land to enable us to put up a polytunnel C D Construction came to our rescue. Nothing was too much trouble for them and they have helped to give the children of Haworth a brilliant new gardening facility. 17 April 2005 Haworth Primary School Gardening Club were awarded the Schools Environment award by the Rotary Club International at Manchester. 13th April 2005 Two judges from Yorkshire in Bloom – Mr Mowforth and Mr Oddy visited and judged the gardening clubs work at the school as part of Haworth’s entry into this years competition. We now await their results and comments at the end of May, which will then be added onto the summer results when two more judges visit in July. 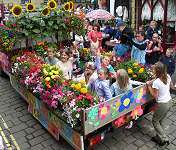 14 March 2005 Haworth Primary School Gardening Club run by Steve Thorpe came 2nd in the Henry Doubleday Research Association Organic Gardens for Schools Projects Harvest Festival Challenge 2004 “How does your garden grow?” category. They were selected from 1100 members. Photo is Steve Thorpe with Sally Bucknall from the HDRA presenting the award to the gardening club. Click on thumbnail for larger picture. Years 1 and 2 planted 30 trees in the schools nature garden to form a hedge. These were given to us by the Woodlands Trust as part of their Tree for all campaign. The gardening club took part in the Harvest Thanksgiving at Haworth Parish Church. They made a display with their cut flowers and made up boxes of fruit and vegetables that were later given away. The children got up and told the congregation about their work throughout the year. 28th September 2004: Yorkshire in bloom results. "Horticultural excellence oozes from every area from around the school. From a newly planted rose bed to herbaceous perennials, raised vegetable plots along with floral planters and tastefully planted hanging baskets, they all provide a fitting environment for a teaching venue. The head teacher and Steve Thorpe should be very proud of the gardening club, which has not only transformed the school but is actively involved in supporting the town of Haworth in the Yorkshire in bloom campaign. A truly excellent achievement. Keep up the good work!" The gardening club entered their flowers and vegetables in the Keighley Horticultural show and won the Prince Smith and Stell Silver vase for best novice flowers. 22nd August 2004 Haworth Primary School Gardening Club took four trophies at the Haworth, Oxenhope, Lees & Cross Roads Gardener's and Allotment Holder's Association's 86th Annual Flower and Vegetable Show. They won the Oxenhope Cup, the Silver Challenge Cup, the Jack Cunningham Trophy and the Woodlands Cup. Click on thumbnail for larger picture. Judges visit Haworth for Summer Judging on 12th July at 10:30am. It is essential that the areas that are judged are as clean as possible. The result after the first round of the two judgings is 5th place and are only 3 points behind the third place, last year we were 7th. The judges commended the school gardening club, the lack of litter in the village and its general cleanliness, the efforts to tackle vandalism, the beautiful park and the effort of traders. A 2005 calender will soon be printed featuring photographs from projects the children have worked on in the area. All profit from the calender will go to charity. There is an article about the Gardening Club in the March 2004 edition of the Readers Digest. Steve Thorpe and Haworth gardening club with local volunteers did a sponsored graveyard tidy at St Michael and All Angels church to raise money for the Yorkshire Air Ambulance and Manorlands. The weather was appalling, raining for most of the day, but this did not prevent work, they managed to uncover gravestones that had been hidden for years. The gardening club have so far raised a fantastic £1,034!